A witness has described how passengers tackled a man who allegedly made a false bomb threat on a Malaysia Airlines plane. Flight MH128, bound for Kuala Lumpur, was forced to return to Melbourne after the man tried to enter the cockpit. The flight landed safely and the passenger was arrested, police said, adding it was not terror-related. One passenger said the suspect was carrying a "very unusual object", which police later said was not explosive. "He ran down the back aisle and three great Aussie heroes wrestled him to the ground and totally immobilised him," the witness, Andrew Leoncelli, told the BBC. The suspect was a 25-year-old Sri Lankan man who was released from a Melbourne psychiatric facility earlier on Wednesday, said Victoria Police Chief Commissioner Graham Ashton. Police initially treated it as a possible terrorism incident before determining it was "a case involving a mental health issue", the commissioner said. Police said the man was carrying a bluetooth speaker or something similar. Malaysia's Deputy Transport Minister Abdul Aziz bin Kaprawi described it as a "powerbank", the AFP agency said. Mr Leoncelli, a former professional Australian Rules football player, said it had two antennae and what appeared to be a smartphone input. He said the suspect told airline staff he needed to see the captain before becoming "really agitated" and making threats, including making button-pressing motions. "I went back to tell the other passengers there was a real threat here, we need to do something," Mr Leoncelli said. Of the passengers who then overpowered the man, he said: "I cannot tell you their names but they are good fellas." Earlier, Mr Leoncelli told Melbourne's 3AW radio station that the man threatened to "blow the plane up", prompting staff to scream for help. Malaysia Airlines said the Airbus A330, carrying 337 passengers and crew, was in the air for just 30 minutes of its eight-hour flight time before landing. Heavily armed police boarded the plane just before midnight local time (14:00 GMT) and placed the man under arrest. 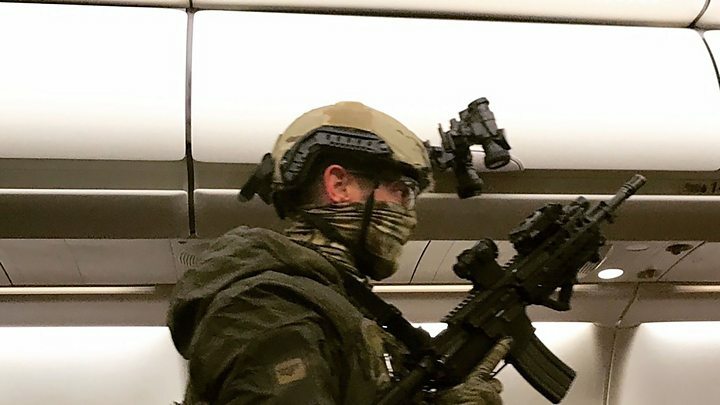 Image caption A photo posted to Instagram by passenger David Henderson: "MH128 boarded by armed police. No one hurt"
Mr Ashton defended what local media said was a 90-minute delay between the plane landing and police intervention. He said counter-terrorism officers had feared there may be other explosive devices or potential suspects on board. "If we had an incident where there were further explosives that were triggered, we could have had a mass casualty incident," he said. "Decisions had to be made about what was the safest way to get passengers off the plane." Mr Ashton said man had been living in Melbourne on a current visa, clarifying earlier information he was an Australian citizen. A number of flights were diverted following the incident, but the airport confirmed it was operating as normal.